In the midst of an acute economic crisis, Angola has decided to open up its telecoms market in a bid to attract foreign capital. Our State of Digital report takes a look at telecoms and digital services opportunity in the Angolan market, sizing up the upsides and risks in the country's digital infrastructure, consumer and enterprise segments. We provide an in-depth assessment of the proposed fourth mobile licence and the privatization of Angola Telecom. Even by African standards, Angola remains as tough a market as they come. We assess whether, ultimately, Africa’s last Eldorado isn’t merely another investor mirage. WHAT EXACTLY IS IN THIS REPORT? HOW MUCH IS IT & HOW DO I GET IT? State of Digital: Angola provides an in-depth assessment of the opportunities arising from Angola’s decision to award a fourth mobile licence and privatize state-owned Angola Telecom. We analyze the current state of key segments of the Angolan ICT market – mobile, B2B and wholesale. 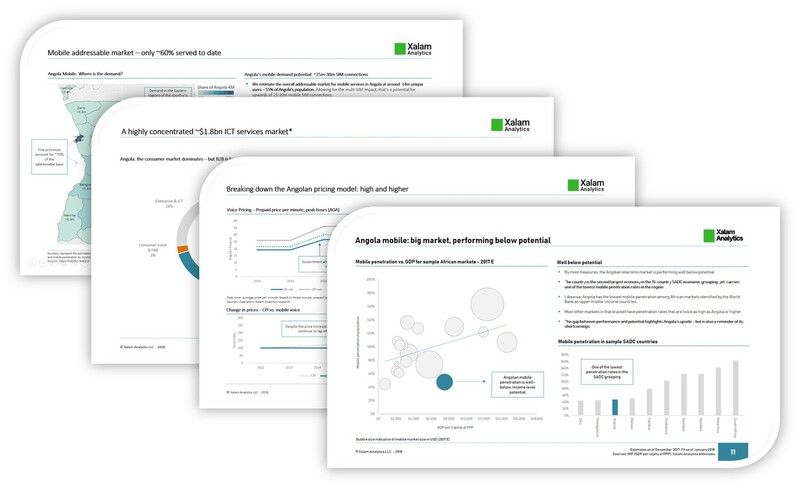 We assess addressable demand and competitive dynamics and lay out our projections for each segment. We make the case (or lack thereof) and outline the critical risks we see for these opportunities, from OpEx and CapEx requirements to regulatory frailty, and the crucial challenge posed by Angola’s web of interlocked stakeholder relationships. 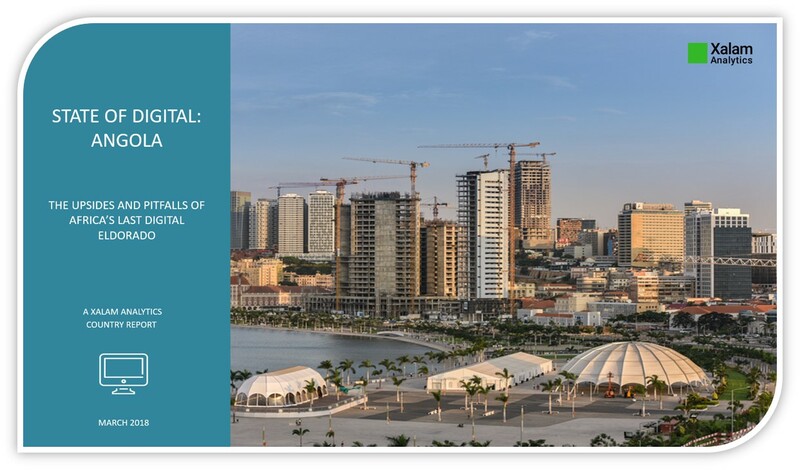 A reference report for any would-be investor in the Angolan ICT market. All in Xalam’s identifiable no-nonsense, economics-focused style. Angola’s economic crisis and a new president are providing the momentum for action the country has long resisted. The potential is solid. This the third largest economy, and the fourth largest telecoms market in sub-Saharan Africa. There is upside: mobile penetration is low, half of Angola’s mobile addressable market is underserved. The very nature of the Angolan mobile market creates substantial room for differentiation for a new entrant. The subscriber case for the fourth licence is strong, as is the revenue case. We find the OpEx and CapEx cases to be extremely challenging. Angola Telecom is a troubled business. But we see solid underlying value in its unique pool of assets; in this case, the parts look better than the whole. A critical characteristic of the Angolan ICT market is its remarkable interlocking of interests. These will be difficult to break. This matters, because success in the Angolan market, in our view, would require a challenging of the existing market structure, along with tangible regulatory action to foster true competition. The opening of Angola’s telecoms market is welcome – but still may not go far enough for the opportunity to be truly compelling. 50 Pages of analysis and extensive data on the Angolan ICT market; demand, supply, key players, pricing and the business case for the fourth licence and Angola Telecom. Key Sections of the report are below. Please download free excerpt for full table of contents, list of charts and sample pages. You can purchase by credit card, for immediate download in the store page of this site. Purchase by Paypal, or Invoicing (Corporate Only Please) also available – Please contact hello@xalamanalytics.com or call +1 617 844 1385 for more information.